O.C. History Roundup: Knott's, Modern architecture, Irvine, Bowers, etc. Knott's, Modern architecture, Irvine, Bowers, etc. So the good news is you're finally tall enough to go on the Sky Jump and the Corkscrew at Knott's Berry Farm. The bad news is the Corkscrew (the world's first inverting steel roller coaster) left the farm in 1989 and is now at Silverwood Theme Park in Idaho. 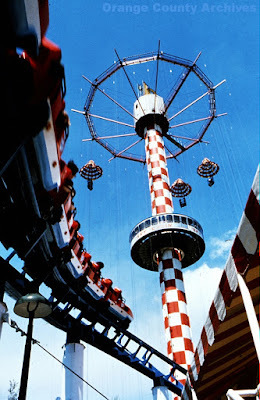 Also, the parachutes of the Sky Jump ceased operation in 1999. Ah, well,... We like the Calico Mine Ride better anyway. Architectural historian extraordinare Alan Hess has two upcoming speaking engagements you can attend. First, tomorrow at 6:00 p.m. at the Laguna Art Museum, Alan will discuss California Modern architecture. Next month, to celebrate the City of Irvine's 50th Anniversary, Alan will speak at the Great Park Gallery, Sept. 19, 1:00 p.m. You may still have trouble saying "Great Park" with a straight face, but this is a darn good reason to drive out there. I noticed two more articles on the Bowers Museum Blog that I hadn't noticed before. One is about the amazing coffered ceiling in their Rancho Room. The other describes the background on a photo of a burst solar heater during the "Big Freeze" of 1937. Yes, that "technology" has been around since at least 1891. And you thought Al Gore invented solar panels! He did not. That's the Internet you're thinking of.